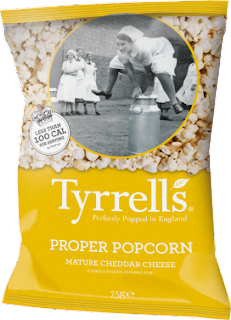 Tyrrells create hand cooked English crisps in the Herefordshire countryside but have also created their own range of popcorn. I was recently lucky enough to be sent a selection of their Proper Popcorn to review. When opening the package, the packaging of their products looked great. Tyrrells have combined great colours with some fantastic black and white "olde world" images. The products show that it is a British made product which I love. I was sent two different flavours of popcorn, Mature Cheddar Cheese and Sticky Toffee Pudding. I was intrigued by the Mature Cheddar Cheese popcorn as I have never tried anything like this before, so I tucked in. In my honest opinion I did not really like the flavour of the popcorn which was disappointing but that is more down to my own preference of tastes. The texture of the popcorn was perfect, it was quite soft which I liked, normally I find loads of hard pieces in other makes of popcorn but also this was not the case. The Sticky Toffee popcorn was delicious and was my favourite out of the two popcorn flavours we reviewed. I loved the flavour and again the texture was great too. 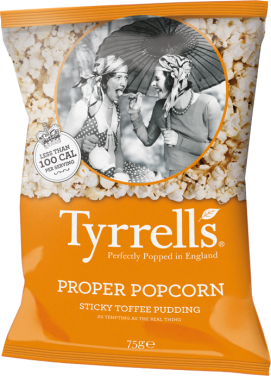 I loved the fact that Tyrrells had used a well known pudding to make a fantastic flavour. I think this flavour would be great for a Christmas snack and could be enjoyed by all the family. For more information about Tyrrells, their products and to keep up to date with all of their competitions visit their website, follow them on Twitter (@Tyrrells) or like them on Facebook. oh yum, have heard about all sorts of different flavours of popcorn recently. 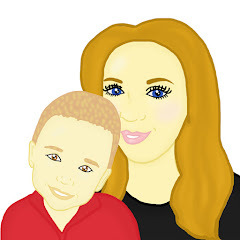 Haven't noticed any unusual ones in the shops yet but must look out for some as would love to try something different! These would be great to try - especially around Christmas!